Comic book adaptations of cinema franchises rarely work, ultimately they feel like they are poorly designed cash tie-ins, offering very little to the overall experience. This was not the case for Archie Goodwin and Walt Simonson’s adaptation of Ridley Scott’s original horror masterpiece – Alien. This was a volume which was, until recently, out of print since it’s original run. Alien: The Illustrated Story has been restored from Simonson’s original artwork and re-released by Titan Books. If you are a fan of the film or of Sci-Fi horror in general, this book is a must have. This was originally published by Heavy Metal in 1979 which means that all the gore and carnage of the original film is translated directly onto the page. The narrative is of course almost event for event the same as the film. However there’s a feel like it is an alternative take on it, with frames angled to tell different perspectives on the well-known story. This makes the comic strip interesting to even those who have seen the Alien films over a million times. There are subtle changes such as the dialogue being different here and there, scenes playing at a slightly different pace and some scenes missing in the movie inserted back in the comic. The artwork of Simonson, who has ascended to legendary status in the 30-plus years since this book was released, can be ornate and detailed, as with the top half of the two-page spread that starts the book and features the title “Alien” depicted in the techno-organic bone style that is so well-recognised today. The art is also rough and tough at times, which is certainly in keeping with the “truckers in space” story. It’s not uncommon to turn the page and discover another stunning layout: a double-splash page of the Space Jockey’s ship. Kane’s shall we say explosive meal (which includes a depiction of the xenomorph in various positions as it slides quickly away in a single panel — an effect that is quite reminiscent of later demonic Simonson imagery from the likes of X-Factor and Thor), or the full-grown alien itself, lurking in the shadows and taking out Dallas, Brett… well, pretty much everyone! The artwork itself is beautiful (in an alien ripping your head open kind of way), but the late Goodwin’s lean adaptation of the screenplay is also part of the success story here. He trims bits and pieces to keep the comic moving at a brisk, readable pace, but it never feels like anything has really been cut. Heck, they even managed to keep Ash’s inexplicable rolled-up-magazine-in-the-mouth form of execution. 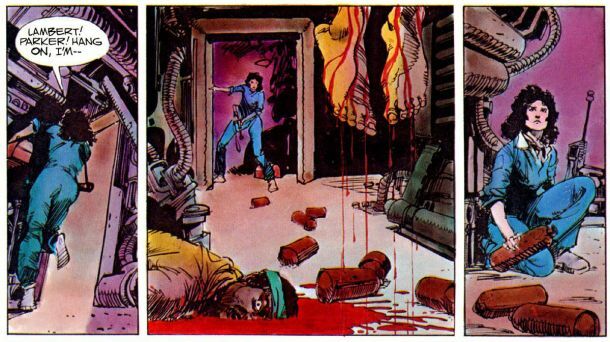 It’s as creepy on the page as it is on screen, and that holds true for much of Alien: The Illustrated Story.